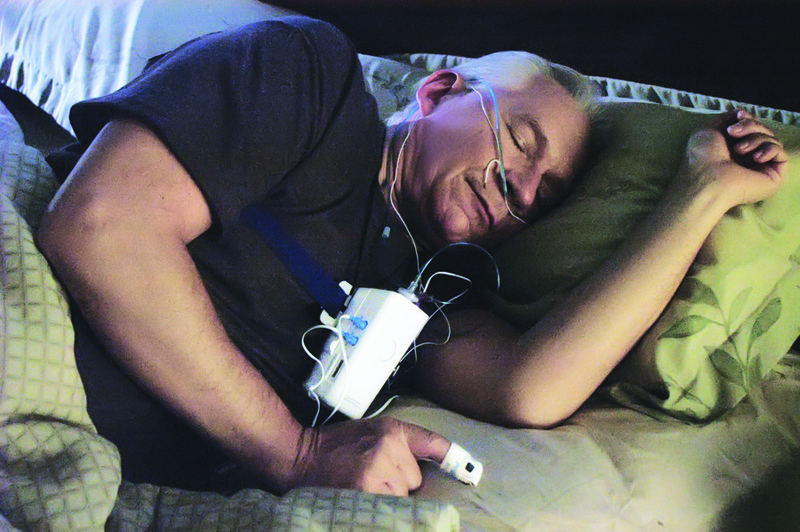 Millennium Sleep Lab provides portable home sleep testing (HST) that can result in diagnosing patients with Central or Obstructive Apnea, in the comfort and privacy of their own home. Technological advances have allowed diagnostics to come to the patient at a fraction of the cost of a traditional sleep lab, while remaining in full compliance with the American Academy of Sleep Medicine (AASM), and it is covered by most insurance plans. As the patient’s physician, you can screen for sleep abnormalities during routine visits and order a home sleep test. Millennium Sleep Lab will contact their insurance to authorize the test and perform a multi-night HST. Advanced HST testing device (by Philips Respironics)… uses sensors identical to in-lab. Multi-night, 8 channel test, including effort belts, actimetry, and body position… ensures sufficient data and detects central apneas and restless leg. Manual Scoring of all test data with periods of wake removed… eliminates false negatives. Interpretation by local boarded sleep physician… provides accurate diagnosis and recommendations. Physician sees a patient with symptoms of Sleep Apnea and faxes an order for a home sleep test (HST) to Millennium Lab. Millennium Lab will then verify insurance benefits and call the patient to schedule their home sleep test. Patient will complete the study for 3 nights (per directions included with the device). Patient will return the device to Millennium Lab via a pre-paid shipper (per directions included with the device), or pick-up by a representative of Millennium Lab. Once Millennium Lab receives the device back from the patient, the data captured from the 3 night study will be downloaded and scored and a patient sleep record will be created for our Board Certified Sleep Physician to interpret. When interpretation is complete, Millennium Lab will fax both the diagnostic report and the doctor’s professional interpretation of the results to the ordering physicians office. Depending on each patient’s test results, the ordering physician will schedule a follow-up visit to continue support of the patient’s sleep health. In cases of Sleep Apnea, Millennium Lab will contact a DME provider for possible CPAP setup (providing the patient has given the DME authorization to access the test results). Let us help you connect with other medical sleep professionals, Dentists, or Contact Us for more info.